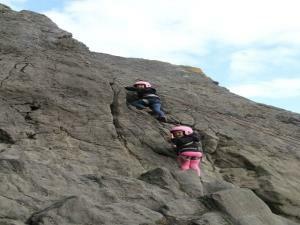 Climbing at Cardigan Bay Active01239 612133work Rock ClimbingClimbing is a great activity which works almost all muscle groups in a natural way by supporting your own body weight. You don’t need to be particularly strong, as your qualified instructiors will show you correct movement and the most efficient holds. You can try this exciting sport with us in the breathtaking backdrop of sea cliffs or the mystical Preseli mountains. Our climbing sessions are ideal for all ages and abilities, and due to the natural venues we use each session includes about 50% climbing and 50% abseiling. You don’t need any previous climbing experience, but even if you do climbing with us is an ideal way to make the first step from indoor to outdoor climbing, for trying new rock or testing out new techniques. Abseiling (that’s coming down the rock). Climbing is a great activity which works almost all muscle groups in a natural way by supporting your own body weight. You don’t need to be particularly strong, as your qualified instructiors will show you correct movement and the most efficient holds. The venues we use are selected to provide you with an excellent introduction to this exciting sport. All equipment is included and all our climbing staff are climbers, so you’re in safe hands.